Abraham Ha and his two brothers were in search of a new life. In the late 1970s, they left their parents and a few other siblings and escaped Saigon on a raft bound for a free land. They had no idea where they were going, really. After enduring nearly a week in the pirate-laden and shark-infested waters of the South China Sea, they were picked up by UN Refugee Services and brought to a camp for Vietnamese refugees on the island of Palawan in the western Philippines. Because Abraham was one of the only persons in the camp who spoke fluent English, he was able to secure an important post as a UN translator and later negotiate passage for himself and his two brothers to the United States - where they could begin a new life in freedom. Last June, like myself, Abraham Ha was ordained a priest of Jesus Christ for the Diocese of Allentown, Pennsylvania and now serves the Catholic population of Vietnamese descent in that diocesan church. Abraham was also my next door neighbor and classmate for the better part of four years in the seminary and I have met fewer people who have a true appreciation for what it means to have a second chance at life. Our readings today speak about new life. In our first reading from Ezekiel, we hear how God assures Israel that He will open their graves and put His Spirit within them so that they may live anew. In our second reading, St. Paul assures the Romans that even though the body is dead or corruptible because of the effects of original sin, the Spirit is alive - the same Spirit that raised Jesus from the dead and the Spirit that will raise our mortal bodies in the resurrection of the dead in the life of the world to come. And then there's today's Gospel and one of the more well-recognized miracles of our Lord - the raising of Lazarus from the dead, giving this intimate friend of Jesus, new life. This miracle deserves the bulk of our consideration today for not only does it demonstrate our Lord's power over death, but it also tells us much about our individual journey from sin to virtue; from darkness into light; and from despair into hope. It also tells us much about the person of our Lord - who He really was and is, and why our candidates and catechumens have chosen to follow Him more earnestly as members of the very Church He founded. In our Gospel this morning, we learn that Jesus was in Jerusalem with his disciples when He learns that Lazarus is near death. Lazarus, Martha and Mary lived in Bethany, only about 2 miles from Jerusalem. Yet our Lord does not rush to get to Bethany to be with Lazarus - He decides to wait several days and by the time He gets to Bethany, Lazarus has been dead for four days. Why didn't Jesus get over to Bethany before Lazarus died? Surely, He could have saved him. We learn that Jesus purposely delays his arrival in Bethany in order to use Lazarus' death as a teaching moment - to demonstrate that He has power over even death itself. We experience the same phenomenon in our own lives. We often wonder why God doesn't do something about a particular situation until it's seemingly too late. We often don't trust that our Lord's timetable is the most wise, the most prudent, the most sure way for us to draw closer to Him and towards salvation. Sometimes our Lord makes us wait for Him - learning to trust his timing is often so difficult to do. St. Augustine tells us that even though Lazarus dies, his death is to be used for miraculous purposes so that the hearts of men might be converted and believe in Jesus and thus avoid the true death - the death associated with a lack of faith in our Lord. When Jesus arrives at Bethany, He is met by Martha and Mary. Martha expresses her personal faith in Jesus as the only Son of God and in the Resurrection of the Dead. Her confidence in our Lord and in His ability to raise Lazarus from the dead is worthy of our imitation. Martha has been given a divine insight that our Lord is not a mere mortal who became infused with divine powers. Rather, Martha believes that Jesus is a divine person, who has taken on our human nature. He is not a human person - but rather, a divine person who has always existed but who in time and place takes on our human nature. Hence, Jesus is the Resurrection and the life - precisely because He is a divine person for no mere mortal could make this claim. Jesus is the Resurrection because by his victory over death He is the cause of the Resurrection for all men. Christ has the power to give life to all people - my brothers and sisters, that is divine, not human power. Before he raises Lazarus from the dead, Jesus shows us the depths of his humanity. 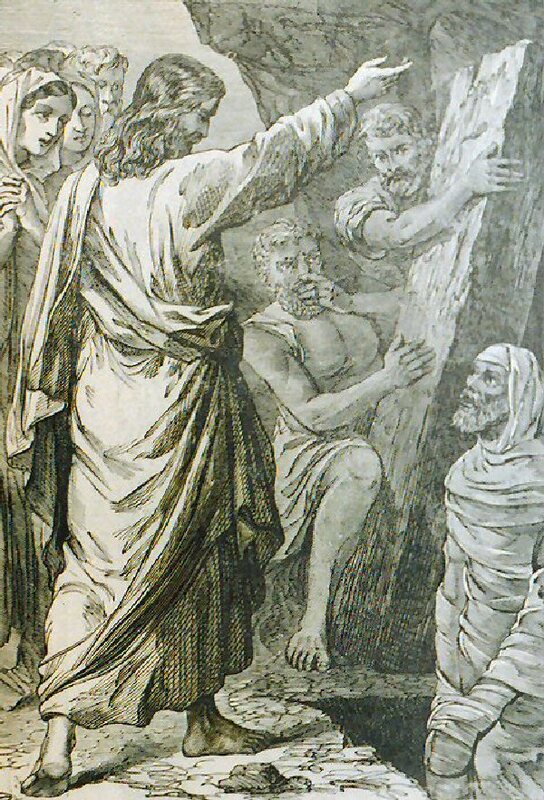 At the sight of Lazarus' tomb, Jesus becomes perturbed and deeply troubled. And verse 35 of this passage has only two simple words: Jesus wept! St. Augustine asks that if Christ wept over the physical death of Lazarus, how much more does He weep for our sins, which is real death? Jesus, with his truly human heart weeps so as to teach us to weep for our sins. We ought to appreciate our Lord's tears - Jesus prays for us. He is our friend and He knows the depths of our humanity, save sin. He loves us as much as He loved His dear friend, Lazarus. Finally, Jesus grants Lazarus new life. Notice that Lazarus is raised from the dead - he is not resurrected. Lazarus, who is raised from the dead, will die again later on. Jesus, who is resurrected, will never die. Resurrection is an entirely new mode of existence, life in the glorified state. His is not what Lazarus experiences in this miracle. Jesus calls Lazarus by name, which suggests that although Lazarus is really dead, he has not lost his personal identity - the dead continue to exist, but in a different mode because they have passed from this life to the next. Lazarus' coming forth from the tomb is akin to the soul's spiritual raising from the dead. Lazarus was dead and decaying, much like the person in mortal sin. Yet, Jesus calls Lazarus from the darkness of the tomb. Jesus calls us from the darkness of sin into his marvelous light, even if we are dead and decaying spiritually. When Lazarus comes forth, he is still bound in bandages. Similarly, the sinner who comes forward, acknowledging their sinfulness, must be unbound by the priest in the Sacrament of Penance. Jesus calls us out of sin; the priest, acting in the person of Christ unbinds us and lets us go forth. It is no wonder that Jesus tells the apostles on Easter Sunday night - whatever you bind on earth will be bound in heaven and whatever you loose on earth, will be loosed in heaven. This is evidence of the foundation of the Sacrament of Penance and the priest's capacity to bond and loose sin. This Gospel must speak volumes to our catechumens and candidates. Like Jesus who delayed his arrival in Bethany, you could have come to the Church much earlier in your life, but God had a special plan for you to come to the Church in the time and in the way that you have. This is no mistake - Pope John Paul II reminds us that in the grand designs of Providence, there are no mere coincidences. Seeking full communion in the Church is not just merely changing churches for each of you - you know full well that becoming Catholic means assuming a whole new life; an entirely new and unique way of looking at the world and life and love. And finally, many of you will receive the Sacrament of Penance for the first time in the coming days. Like Lazarus before you, it is my prayer and the prayer of this entire parish that you will earnestly heed the command of Jesus who calls out to Lazarus - to come forward and be freed of all that binds you. May your final days of preparation find each of you ready to answer the call to come into the new life - into the marvelous light of Christ's Holy Roman Church.